Bronze Age cists, have been found at such places as East Hills and Skechen dating back to around 2000 to 700 BC. In the Iron Age, Roman military camps (held 25,000 men) were in operation in the area for possibly twenty five years in the 1st century AD. 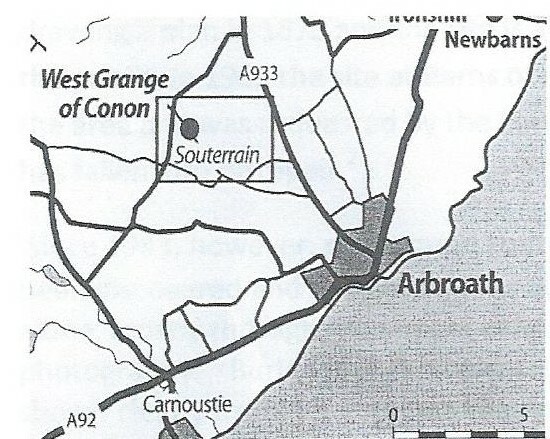 West Grange of Conon souterrain, situated SW of Carmyllie parish boundary, was built around 1st century AD and had possibly outgrown its use by 4th century AD in a pre-Christian Celtic paganism period. An above-ground settlement may have been there until at least 6th century AD. Before the formation of Carmyllie parish in 1607, landowners owned stretches of land, such as 'Carmyly', Glester, Curr, Skechen and Conon all within walking distance. Conon was by far the earliest (1180) name mentioned in the Arbroath Muniments written by the monks of Arbroath Abbey. There was already a pre-reformation chapel on Strachan's 'Carmyly' lands when an act of Parliament was passed in 1609 to erect Carmyllie Kirk 'into a parochial charge' the whole parish was then named Carmyllie. The extremities of the Inverkeilor lands which included Cononsyth Estate and Backboath were brought within the Carmyllie boundaries together with Panbride's outlying lands round the Firth. The Guynd Estate, later acquired by the Ouchterlonys c.1615, was brought into the parish.